AMONGST THE DIFFICULT and obscure terms we Buddhists inherited from our Iron Age Indian predecessors, papañca is one of the most intriguing. Papañca is an interesting case study of a concept which, despite being rendered in English relatively easily, remains very difficult to understand. In this first of two essays I will look at how to translate this word, while in the second I will look at what the word means in context. 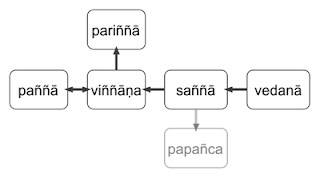 The Pāli Text Society Dictionary (PED) derives the word papañca (Skt prapañca) a root √pac or √pañc 'to spread', which forms stems with a nasal giving. This root is included in Pāṇini's Dhātupāṭha, unfortunately, it is not included in Whitney's Roots. Monier-Williams' Dictionary lists "pac or pañc 1: to spread out, to make clear or evident." (p.575a) and it seems at first glance that our word is generated from this root. The underlying metaphor, if this is correct, is analytical: separating things out in order to make plain what is there. Sometimes when objects are all jumbled up we cannot see what's what, and so we separate them in order to allow the differences to be clear. Hence, the double meaning of separate and clarify. Lexicographers have seen papañceti as a denominative verb, i.e., a verb derived from the noun papañca. The root is more nominal than most and, indeed, there do not appear to be any other words which derive from this root. Which suggests that the traditional etymology may be wrong. In the Sanskrit grammatical tradition, from at least the time of Patañjali, the word prapañca is used to indicate specifying the instances which come from a general rule (lakṣana) or the expansion of that rule into examples. It is used in this sense in the Vyākaraṇamahābhāṣya. If we look at the semantic field ‘to spread’ then there is a Proto-Indo-European root *pet ‘to spread’ which comes into English in words via Latin (via French): expand, pan, pass, past, and spawn; via Germanic fathom, and compass. From this root we see in Greek πετάννῡμι (petannumi) ‘to spread out sails’; in Avestan paθana- (pathana) 'wide, broad'; and in Swedish panna ‘forehead’. It’s clear from other branches of the Indo-European family that the second consonant is quite changeable. However, the Sanskrit cognate based on Avestan paθana would be √prath ‘to spread’ (with forms prathate, pṛthu, prathana). This is the only possible alternative I have been able to locate. Richard Gombrich derives papañca from pañca 'five' and suggests that it should mean "quintuplication" (What the Buddha Thought, p.205). He notes that in some texts (e.g., Mahābhārata) the world evolves from "primal unity" into sets of five, for example the five sense, the five great elements. There are, in fact, a large number of sets of five in Sanskrit literature, and these become much more prominent in Tantric literatures where they are arranged in layered maṇḍalas with four cardinal points and a centre. The symbolism is often that the four are synthesised in the central fifth, and that the maṇḍala itself represents the whole universe. Tantra, in particular, looks for homologies between these sets of five. The problem, as Gombrich notes, is that we find no evidence of the Sanskrit prapañca being used in Vedic texts early enough for the Buddha to have known about them. However, the evolution into sets of five is a theme in Bṛhadāraṇyaka Upaniṣad and other Upaniṣads without using the word prapañca. As mentioned, Pāṇini records the root √pac/pañc and he lived about a generation or two after the Buddha. The suggestion is that, although the word is coined around the time of the Buddha, the concept is somewhat older. I think Gombrich is on the right track and would like to offer some refinements to his theory. The PIE root of the numeral five is *penkwe, from which Vedic páñca derives and gives us Sanskrit pañcan and Pāli pañca. The PIE numerals have remained remarkably stable across the Indo-European language family, e.g. Monier Williams offers a clue to the meaning of papañca/prapañca when he notes that pañcan 'five' means 'to spread out the hand with its five fingers'. That there would be a link between the number five and the five fingers is not surprising. Indeed, PIE *penkwe, also means finger, and this link is present in Germanic and Slavic languages. The word 'fist' is also related in West Germanic languages (English, Dutch, German) via *fungkhstiz from PIE *pngkstis, and in Slavic languages. That the relationship between five and finger is not present in Sanskrit is a weakness of this line of reasoning. However, other words are preserved in archaic forms. For example, the standard Sanskrit word for 'heart' is hṛd. The word śraddhā preserves a form more closely related to PIE *√kred 'heart'. 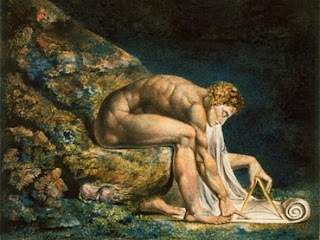 PIE /k/ regularly becomes /ś/ in Sanskrit. Once in Sanskrit śrad then undergoes another change to hṛd, which is used in all other circumstances except the semantic field of ‘trust’. That the change came later is shown by the Avestan zərəd- ‘heart’, and zraz-dā- ‘believe’ (= Skt. śraddhā = Latin credō). I’m proposing, somewhat speculatively, that a parallel process occurred with pañca in connection with fingers. If this is true, then rather than simply 'quintuplication' (i.e., multiplying by five) the underlying metaphor is one that draws on the physical facts of the hand: the five fingers emerge from the hand; one can spread the fingers and separate them to make them distinct. In English we sometimes call the fist a "bunch of fives". Opening the fist makes it clear if something is held in the hand or not – the open hand is a universal gesture of greeting. 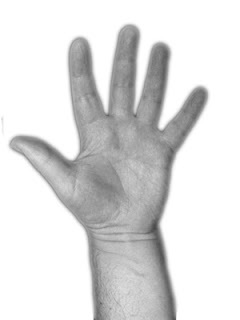 The hand supplies us with the physical experience of unfolding to reveal complexity (five from one), and at the same time clarity (empty hand, spreading the fingers). This explanation is consistent with the theories of metaphor put forward by George Lakoff and Mark Johnson, namely that metaphors derive from how we physically interact with the world. "Passion is a proliferation, aversion is a proliferation, confusion is a proliferation, craving is a proliferation, view is a proliferation, and conceit is a proliferation." This ties papañca into the various kinds of hindrances to progress on the Buddhist path, or the unskilful kinds of thoughts that obsess the unawakened, and suggests to many translators (especially before Ñāṇananda) an interpretative translation; i.e., they try to translate the concept rather than the word. Thanissaro does similarly with "objectification". This procedure is not wrong, by any means, but my preference is to translate the word, and essay the concept separately. The main advantage of this approach is that our word is used in slightly different ways, and the more conceptual translation--especially Thanissaro’s "objectification"--do not always make for felicitous English, such as his "objectifies non-objectification" in the Koṭṭhita Sutta (4.174). In the next essay I will look at various suttas in order to see how this word is used in practice in a Buddhist context. For the Abrahamic religions-- Judaism, Christianity and Islam--free will is central to the problem of theodicy or 'God's justice', aka the Problem of Evil. Theists have a hard time explaining why bad things happen to good people (and vice versa). 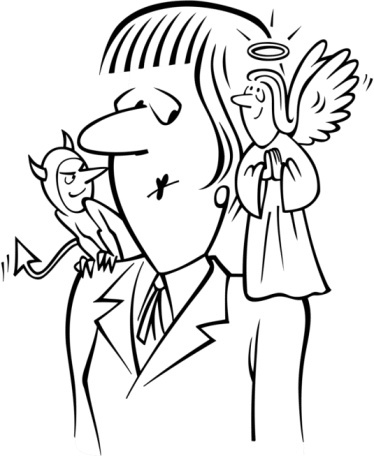 If God is both omnipotent and good (i.e. compassionate), then why doesn't God do a better job? Why allow people, even the supposedly chosen people, to suffer? Surely suffering is bad? Surely, even if there were some grey area, the suffering of the Jews (aka God's chosen people) in Nazi Germany was bad? Yes? The theist answer is that God set the world up, created us, commanded us to worship and obey him, and then gave us the choice of whether to do so or not. What they play down is that God also gave us propensity not to obey God. As Christopher Hitchens put it: "we have been created diseased, by a capricious despot, and then abruptly commanded to be whole and well, on pain of terror and torture." [Washington Post] So evil from this point of view is not God's problem, but Humanity's problem, and the answer to the problem is to worship and obey a God whose actions are inexplicable in human terms. Except that bad things continue to happen to those who actually do worship and obey God. So really there is no satisfying answer to why we suffer from a theistic perspective. Buddhists have little interest in the issue of God, but we are still interested in the Problem of Evil. Suffering is at the forefront our various discourses, and our program relies on the notion that we are free to chose our actions, and therefore our destiny. However I think the issue of free will is a red-herring. What seems more salient is that we can and do assign value to experiences - to some extent all animals do this. It's called "learning". Assigning value to experiences makes us want to repeat them or avoid them, and this builds habits and characters. When we have an experience information about the urgency, relevance and attractiveness of the experience is registered by the amygdala which gives our memories an emotional flavour. This is why memories can provoke emotional reactions just like the original experience, and at the same time why we have stronger memories of emotionally charged events. We can change the value that we give to experiences, by over-riding the amygdala's first reaction with our neocortex. We can do this unconsciously as in Post Traumatic Shock where the value of certain experiences is amplified so that the strength of the arousal associated with the memory provokes a strong fight or flight response each time we bring it to mind. In Clinical Depression the value of experience is dramatically reduced and we no longer feel a sense of reward from doing the things we normally enjoy doing. We can also alter the value of experiences consciously to some extent as when we learn that traffic speeding by us on the road is not a threat unless we step onto the road, or if we learn that the vicious scary dog is always chained up and can't get to us. In both cases the apparent threat turns out to be minimal and the appropriate response might be mildly elevated alertness rather than, say, a fight or flight response. If we look at this in terms of reason and emotion we find that neither can exist without the other. Facts alone do not make for reason. Reasoning is just assigning value to facts, and value is a function of how we feel about the thing. We know for instance that a person with an intact intellect who, through brain damage, is not able to link facts to emotions is more or less incapable of making a decision because they do not give facts different value. Without the ability to weight facts they all seem equally important. Such cases have been reported by Antonio Damasio (Descarte's Error) and Thomas Metzinger (The Ego Tunnel). So reasoning is absolutely dependent on emotions! If I over-value or under-value a fact with respect to the value you place on it, then we may be in conflict - like Atheists and Christians. If I assign a different value to the consensus of society then I am an eccentric or perhaps mad. A person who fails to acknowledge the values of the society around them, and consciously and actively works against those values might even be termed evil. 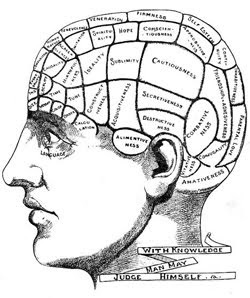 One of the important tenets of neuroscience is that the brain is made up of many parts all working together. This is true of the supposed left-brain, right-brain split as well. The brain can be looked at as separate systems, but it only works as a whole, which we discover to our cost when we sustain damage to our brains! Neuroscience is a lot more holistic than popular presentation of ideas like left/right brain specialisation would suggest, and it's a shame these distortions propagate at the expense of the true picture. This idea about the value of facts being a function of emotional explains, to some extent, why people cannot agree on the facts, or can remain unconvinced in the face of a killer self-evident argument such as the idea of evolution to the explain the diversity of life on earth. For the Christian fundamentalist the Bible and traditional Christian narratives have assumed an over-whelming value. The facts of evolution simply cannot carry the same weight, and since the two ideas cannot co-exist evolution must be wrong or at best irrelevant. Some fundamentalists take the approach of co-opting evolution as proof of intelligent design. Anything as long as nothing takes on a higher value than God. I suggest that this is linked to the very strong emotions we experience around the fact of death, which should not be trivialised. The question people are often implying when they ask "do we have free will?" is "are we free to make any arbitrary decision?" Clearly the simple answer to this is no, we aren't free to make arbitrary decisions. Because the value that we assign to experience is partly genetic, partly determined by our previous experience and our conditioning, and only partly under our conscious control (in order of decreasing influence), but largely assigned unconsciously. When someone says "I had no choice" this is almost never objectively true. We always have arbitrary choices, but we feel constrained. The constraints operate at different levels. We value our own survival over most things for instance, but a mother may value the survival of her infant over herself, or a solider may value the life of his team over his own. To me this seems to derive from our genetic inheritance. Some people value straight talking regardless of emotional impact, and others will sacrifice clarity for politeness, while still others will lie rather than directly disagree with you. I would call this a feature of cultural conditioning. Some people decide to go on a diet, and stick to it for a while, but after a while start falling back into old habits. This is the extent of our conscious influence on decision making. I have will, or better: I experience 'willing'. I value this experience of willing quite highly. However willing appears to operate on different levels, many of which are unconscious or barely conscious. I am free to the extent that I can make my willing conscious. I can be more free by paying attention to the way I make choices and decisions, the way I place value on experiences. I can inquire into what my values really are, based on how I actually behave (rather than what I say my values are). Meditation is one of the most powerful tools for obtaining this kind of self-knowledge. Is there a magical point beyond which I will be completely free? I don't know. But I do know I feel more free than I used to be, and I'm not sure if there are inherent or practical limitations on how free I can become. Why imagine limits when none are apparent? I had originally intended to include a paragraph on humanist and atheist interest in free will, but I ran out of steam. It's really a non-issue for the same reasons. We only think in terms of free will because of theological debates, and there's no parallel debate in Buddhism! image from http://spirituality-and-health.com via Google image search.